It has come to our attention that the REC button of the Digital 4K Video Camera Recorder Action Cam “FDR-X1000V” or “FDR-X1000VR” will occasionally not work. The circumstances for this are when the supplied Waterproof Case “SPK-X1” is used with the Dive Door “AKA-DDX1 ” (sold separately) for underwater shooting to a depth of up to 60 meters. When replacing the door of the Waterproof Case “SPK-X1” with the Dive Door “AKA-DDX1,” the following may happen depending on the situation. The REC button does not work. The waterproof performance degrades due to forceful pressing of the REC button. 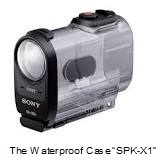 You can protect the Action Cam for up to 10m with the supplied or separately sold Waterproof Case (SPK-X1). We kindly request that customers using the Dive Door “AKA-DDX1” with the Waterproof Case “SPK-X1” to contact your local Sony Contact Center to request a free inspection. You will be required to provide the Dive Door “AKA-DDX1” and the Waterproof Case “SPK-X1” for this inspection. Please contact the Sony Customer Contact Center via 1300 137 669 Monday – Friday 8am – 6pm AEST to book your free inspection or discuss the situation in more detail. We apologise for any inconvenience this may have caused and thank you for your understanding and cooperation.